$1.00 off Charmin Ultra Soft or Strong 6 Mega Roll, 9 Big Roll, 12 Double Roll or larger! Excludes Essentials and trial/travel size. Coupon expires 2/25/17. 12-pack Charmin Essentials Toilet Paper, only $3.22 at Walmart! You don’t see a deal like this for Charmin toilet paper everyday. Right now, 12-packs of Charmin Essentials are on sale at Walmart for only $4.97. Pay only $3.22 by using a $1.00 off coupon and then submitting a $.75 Ibotta rebate. Grab them while they’re still available! Ibotta rebate valid through 12/09/16. Coupon expires 12/31/16. 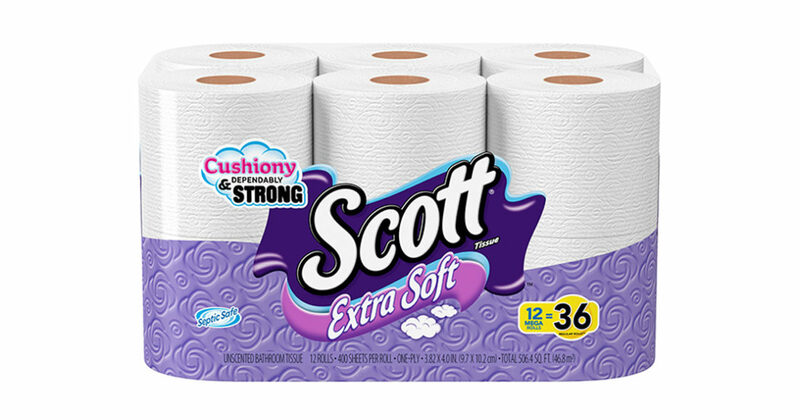 Get 15-roll packs of Scott bathroom tissue for just $4.99 at Target! [($9.99 x 2) – (.15 x $9.99 x 2) – ($1.00 x 2) – $5]/2 = [$19.98 – $2.99 – $2 – $5]/2 = $9.99/2 = $4.99 ea. Coupon expires 10/08/16. Target Cartwheel promotion expires 10/01/16. You can also mix and match Kleenex and Cottonelle in with this offer to take advantage of the savings. You’ll only be able to use one $1.00 off coupon, though. Click here to learn more about Target Cartwheel, Target’s exclusive mobile app that gives consumers thousands in savings. $1.00 Off one Charmin Ultra Soft or Strong! When you have to go, you have to go. We all do. So why not do it in luxury and style, with Charmin? Designed for your comfort and more absorbent then its leading competitors. With this coupon, get $1.00 off one Charmin Ultra Soft or Strong 6 Mega Roll, 9 Big Roll, 12 Double Roll, or larger (excludes Essentials and trial/travel size). Expires 9/24/16. SAVE $1.00 on any one package of Scott Bath Tissue (8-count or larger)! When you have to go, you have to go. You also have to make sure that your bath tissue is soft, gentle, and nice to use — without breaking the bank. Luckily, Scott is here to save the day and get the job done, at a reasonable price. Try their special tube-free toilet bath tissue; when the roll is done, there’s no tube to toss! With this coupon, save $1.00 on any one package of Scott Bath Tissue (8 count or larger). Expires 9/10/16.